Soldering is the only process where the outcome can be impacted in real time. One of AIM’s field engineers came back from a cross-country trip this week with stories of a profiling issue that was giving the client difficulties. Ultimately, the issue was design-related with a large ΔT that could not be overcome with the equipment used in production. It took a full day of attempts to make that final assessment. Picking the right tool to prevent electrochemical contamination at the rework bench. With RoHS exemptions set to expire, can SAC305 hang on? With RoHS exemptions set to expire, the SMT market might see a host of new solders. I vividly remember a moment in 1994, sitting in a job interview, trying to conjure an image of the periodic table for the abbreviations for tin (Sn) and lead (Pb). Of course, these weren’t easy guesses because both elements’ abbreviations are derived from their Latin roots: tin from stannum and lead from plumbum. I incorrectly provided my interviewer with the abbreviation for titanium (Ti) and the famously nonexistent unobtainium (Uo). As confused as I was at the time, little did I realize how simple things actually were. Stop Tweaking the Ground Pad Prints; Start Tweaking the I/O Prints. Would you believe QFN ground pad voids could be cut by over 50% with a zero-cost, super-simple stencil aperture modification? Not a mod to the ground pad apertures where the voiding is problematic, just to the I/O apertures? Neither did we. That’s why we did some deeper digging into what we are now calling the “AIM I/O” aperture modification. In November’s column, we reported a dramatic reduction in voids when QFN I/O pads were left unpasted, and mentioned our technical staff’s observations and ensuing experiments led us to this new void mitigation technique, but we didn’t explicitly describe the I/O aperture design. It’s a simple overprint at the toe of the pad. Sometimes the answers to the most tenacious questions are right under your nose. As I sit in Chicago’s O’Hare Airport having just left another productive and exciting SMTA International trade show, I reflect on what an excellent opportunity this event presents to network and stay current in the world of electronics assembly. If you don’t attend these events regularly, you should. I was fortunate to have the opportunity to attend a number of the technical conference sessions and not only learn what is emerging, but also speak with customers and colleagues on what they see as the most pressing needs of the market. STENCILS: Coated vs. Uncoated... what’s better for the process? We’ve been doing a lot of print testing in our lab. In our first set of published results, “The Impact of Reduced Solder Alloy Powder Size on Solder Paste Print Performance1” from IPC/APEX 2016, we revealed a hierarchy of input variables to maximize solder paste transfer efficiency and minimize variation. In that study, we used a fully-optioned stencil as part of the equipment set. In order to tease out the data we were looking for, we could not lose critical information to the noise of stencil-induced variations. From the Apple™ Watch and body cameras for law enforcement to virtual reality hardware and autonomous transportation, the demands and opportunities for electronics to improve our lives are only limited by our imagination. The capability of existing PCB assembly technology needs to advance rapidly to meet the mission profile of these new devices. The demand common to all of these devices is increased functionality in a smaller space. For the solder paste manufacturer, this path inevitably leads to incorporating finer metal powder into solder paste to facilitate ultra-fine pitch printing. In this study, we will evaluate the benefits and implications of finer mesh solder powder on critical aspects of solder paste performance. Stencil printing is efficient and effective, but it is not without its limitations. 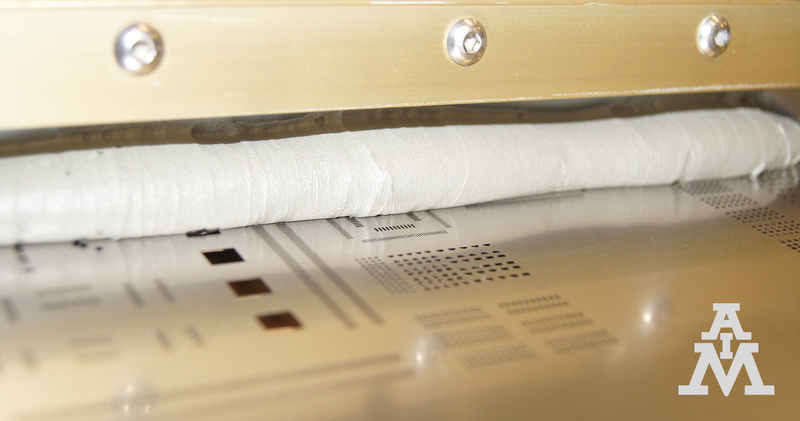 Stencil printing is an efficient and effective way of applying millions of well-controlled solder paste deposits, but it is not without its limitations. Many packages, such as area array and bottom termination components, keep getting smaller, while connectors, shields and other big components remain the same size, or grow even larger. Pushing the limits of stencil printing on either or both ends of the printable size spectrum can present considerable challenges for PCB assemblers. Or what the @#$% is a squircle, and what is it doing on my stencil? The term “squircle” is a portmanteau, or mashup, of square and circle. It’s a real word, and the shape is also known as a superellipse to supernerds. We jest, but besides having a funny name, the squircle is an effective tool for maximizing solder paste release and overall deposit volume. A squircle (FIGURE 1) is a square with rounded corners that, when incorporated into stencil aperture designs for small area arrays, provides better print quality than either a square or a circle alone. It brings the best of both worlds to an extremely challenging part of the printing process. 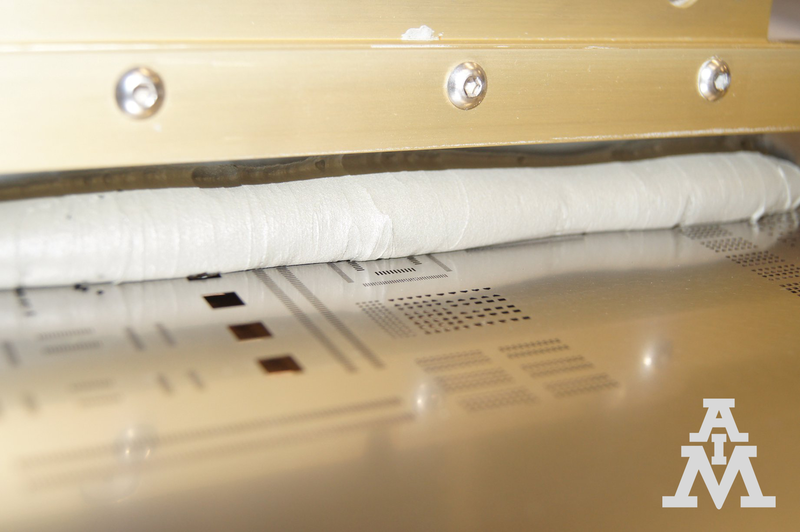 Paste viscosity can inform why solder performs differently under different conditions. Viscosity and thixotropy are not words heard in casual conversation, yet they are very common material characteristics we encounter in our everyday lives. Proper handling and storage controls go a long way toward print quality. Solder paste is an elaborate mixture of metal powders, acids, thixotropes, solvents and a variety of other chemicals. When combined, the reactions and interactions can be extremely varied and complex. When designing solder paste chemistry, key considerations include not only its inprocess performance but how to maintain the stability of that performance against the rigors of time, temperature fluctuations and usage. In Search of the Perfect Solder Paste. Hint, it's a moving target. Solder paste – that ubiquitous, viscous, sticky blob that is applied as the first step of every SMT assembly process – is a surprisingly complex product. It is composed of two primary constituents: solder powder, which accounts for 85% to 90% by weight or 50% by volume, and flux medium as the balance. As complicated as powder development and manufacturing can be, flux medium is even more so, due to the myriad demands and constraints placed on it. A finer type solder paste may solve one problem only to create another. From Univac to the latest wearable gadget, electronics keep shrinking. As transistors get smaller, so too do their packaging, solder interconnections, and a key ingredient in making those interconnections: solder powder. Often overlooked on miniaturization roadmaps, the ultrafine particles of metal carried in solder paste play a critical role in solder joint formation, and must be optimized for printing and reflow of subminiature solder joints. To err is human; to blame the other vendor is… policy. Nearly every process engineer has found themselves in this quandary: something goes awry with the process, and the supplier finger-pointing begins immediately. With machines, chemistry, components and PCBs all factoring into the mix, it often appears that a supplier’s first line of response is to deflect responsibility rather than help seek the root cause. Chemistry providers don’t have the luxury of suggesting a few mechanical measurements or a quick check under the hood to rule out our products as the source of problems, so we are accustomed to rolling up our sleeves and helping solve them. We recently received a call from a contract assembler that was fighting solder balls after reflow. They were getting solder balls on one capacitor and tried to address it with profile changes. Sometimes the problem went away, but it always came back. They were also getting blowholes in the same solder joints from time to time. On which components are the solder balls occurring? And why waiting until the last process step is a bad idea. BTCs, or bottom termination components, are a class of package referred to by a variety of acronyms and abbreviations. Different component and packaging companies may use different nomenclature (FIGURE 1), but almost all these components share one common, ugly characteristic: large pads that are prone to solder voiding. By design, these large thermal or ground pads require a defined percentage of contact with the solder and PCB to properly conduct heat and/or electricity. Excess solder voids can impact performance and reliability of the package. Silver is a known whisker promoter but small amounts of bismuth mitigate the problem. Alloy composition has a strong influence on tin whisker production and has proven to either mitigate or exacerbate the propensity for a solder to whisker. In our year-long study of the relationship between alloy composition on tin whisker formation, SAC 305 notoriously produced more and larger whiskers than any of the other alloys tested.